Several challenges lie ahead for a blueberry industry that has undergone a dramatic expansion in recent years, according to Cort Brazelton of Fall Creek Farm and Nursery. But opportunities abound, as well. Projecting forward to 2019, Brazelton said global blueberry production is expected to reach 800,000 metric tons, or 1.7 billion pounds. “We’re not small anymore,” he said. “Last year, there were weeks where we saw significant increases in year-on-year volumes,” he said, “weeks where the volume was 20, 25 percent higher than that same week the previous year. The frozen market, meanwhile, “has not been strong for the last few months,” Brazelton said. Despite these occurrences, Brazelton said several factors hold promise for the blueberry industry, including additional opportunity to tout the health benefits of blueberries. “The health message is global,” he said. “The health message is getting around.” But, he said, “There is an enormous amount of work that could be done to help increase the awareness of the health benefits of blueberries. “There are opportunities in continued market development and market access,” he said, adding that people throughout the world have more money to spend. “There is increasing purchasing power,” he said. 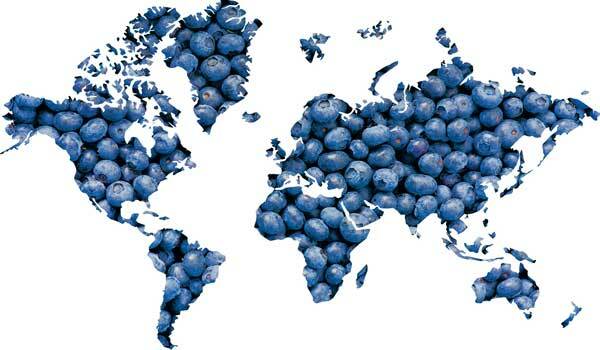 Brazelton said he has seen a significant increase of blueberries in European grocery stores. “There is finally product on the shelf that people can buy,” Brazelton said. “The fact is, there is high awareness of blueberries now. “Five years ago, if you walked into a supermarket in Italy or you walked into a supermarket in Spain, you would never have seen blueberries,” he said. “Now you walk into a supermarket and there are blueberries in these places. “People know what blueberries are and they know they are healthy,” he said. The United Kingdom, Germany and some Scandinavian countries saw 25 percent volume growth and 28 percent category volume growth last year, he said. Asia, meanwhile, represents “by far the biggest export opportunity for Northwest growers,” Brazelton said. Getting tariffs reduced for processed exports and gaining market access for fresh blueberries into China are keys to expanding those markets, he said. Also, he said, “Growers and packer/marketers need to develop post-harvest and shipping systems that ensure successful market arrivals to Asia. One significant challenge facing the industry is a need to maintain quality across production regions. While the health message “gets them in the door for that purchase,” Brazelton said, what keeps consumers buying blueberries is consistent quality. “Unpredictable quality will result in variable consumer experience and when that happens they don’t come back and buy as quickly,” he said. Another key to market expansion lies in the ability of the industry to embrace technology. “There are exciting new technologies for growing, new technologies in harvest, especially as they coincide with farm design, management practices, new genetics. And there is new post-harvest and delivery technology. “Leveraging those things together will make us more competitive as producers and will help us grow this market with better quality,” he said. Also, he noted, it will be important going forward to continue to support industry associations and commissions and to conduct aggressive generic promotion. And the development of new fresh and processed products offers significant market opportunity. “There are huge opportunities there,” he said.